Available for the Kindle & iPad, and as a Hardcover. 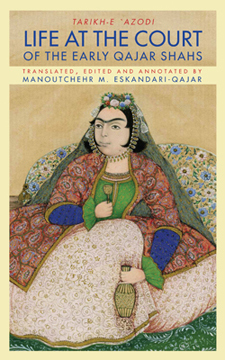 Life at the Court of the Early Qajar Shahs,a memoir translated into English for the first time, offers a uniquely intimate look at a world veiled by privilege and power. Its author, Soltan Ahmad Mirza, was a prince—the forty-ninth son of Fath Ali Shah Qajar, who ruled Iran from 1797 to 1834. Looking back over the reigns of his father and two other shahs, he assembled a vast wealth of detail about life at the apex of Persian society: the role of the ruler, the hierarchy of the harem, court eunuchs, ceremonies, diversions, disputes, occasional violence, and—as a nexus for it all—an extraordinarily intricate web of connections by birth and marriage. This translation not only includes the complete text of Soltan Ahmad Mirza’s memoir, but is augmented with a great deal of additional contextual information and ancillary materials that makes the book an invaluable source to those interested in this important era of Iranian history. Dr. Eskandari-Qajar is founder/president of the International Qajar Studies Association (IQSA), a scholarly association dedicated to the study of the Qajar era. In 2009, he joined a team of scholars at Harvard University working on the NEH-funded Women’s Worlds in Qajar Iran Harvard Project. The Project’s aim is to safeguard digitally and make available documents, photographs and oral history of women in the Qajar era.